As many of your know I’m taking part in NaNoWriMo. What is NaNoWriMo? It’s writing one 50,000-word novel from scratch in a month’s time. Crazy, yes I know. I tired it last year and failed miserably. This year I am more determined. On the 15th November, I passed the 25,000 mark so I’m half way there and on target for completion. I just hope I can get to that finish line. What is Take Five? Take Five is a great event, which gives you somewhere to go and read about writing when you hit a bit of a wall. That way you are still in the writing zone effectively. 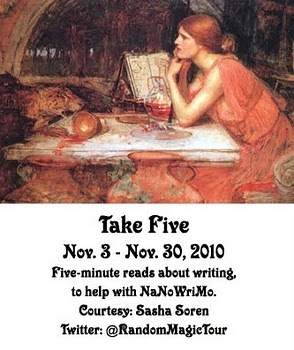 So go on, take Five while doing NaNoWriMo. Just a little breather. Go check it out on the Random Magic Tour. If you don’t hear from me, see me online or in person for the month November, I will be slumped in front of my laptop writing my novel. I have to say it’s a lot tougher than I thought but it’s enjoyable. I have to thank several authors, you know who you are for all your help, encouragement and advice. Also several fellow writers, who I could not do this without you. Thank you so so much. Good luck Susan, if you've reached the halfway point I'm sure you'll do it. That's some dedication you've shown already! Yay! You're halfway there! You can make it! !